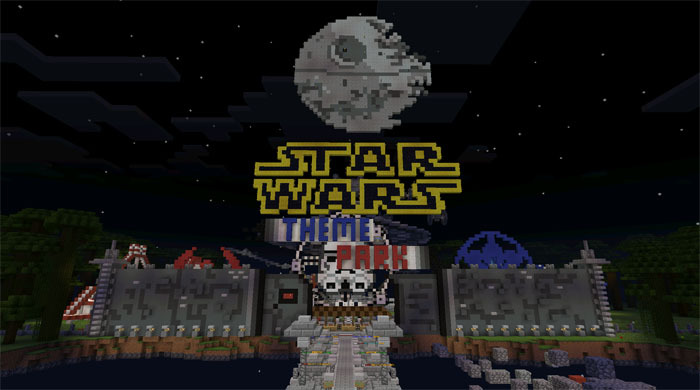 The Star Wars Theme Park is an amazing map to experience, especially if you are a big fan of Star Wars. There are loads of things to explore and experience. Everything from roller coasters to minigames. The design and layout of the theme park is just surprisingly impressive. To really get an idea of what this map offers check out the images further down, you’ll love it! Here’s the Darth Vader roller coaster which is one of many attractions to try out. Some attractions are just for the looks, like this ferris wheel. Go for a ride around the Star Destroyer or enter the spaceship and have a look at the interior. Endor Search is a little minigame where you need to find some different places. iOS Warning: A couple of iOS users have reported that this doesn’t work for their devices! It might crash on your device!